- Do not use if you have ever had an allergic reaction to this product or any of its ingredients. - Ask a doctor before use if you have liver or kidney disease. Your doctor should determine if you need a different dose. - When using this product do not take more than directed. Taking more than directed may cause drowsiness. 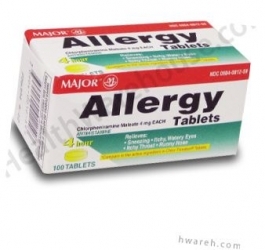 - Stop use and ask a doctor if an allergic reaction to this product occurs. Seek medical help right away. - Keep out of reach of children. In case of overdose, get medical help or contact a Poison Control Center right away. -Tamper EVIDENT: DO NOT USE IF BLISTER UNITS ARE TORN, BROKEN, OR SHOW ANY SIGNS OF TAMPERING. For questions on this product please call 1-734-743-6000.